The poster above caught my attention when I saw it on my friend's FB page. So, I decided to share it with you, my dear readers. 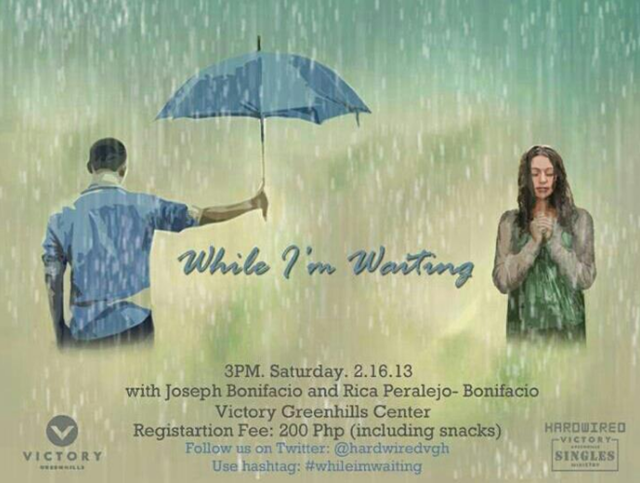 It turned out that the poster is about an event for singles this Feb 16, 2013. The speakers for the event are Mr. Joseph Bonifacio and Rica Peralejo-Bonifacio. This event is open to all! You may register every Sunday after every services at Victory Greenhills Center. You can also register on Feb 16, 2013. Yes, you can bring a date and invite your friends! Don't get me wrong. I am a devout Catholic since birth and I don't have plans to change my religion as of the moment. I think it won't hurt if I attend this event, right? All of us here on earth are a work in progress and learning a new thing or two from other people is not bad. Who knows? It might be the answer we are waiting and looking for. Note: Sold out na daw po. I am not in any way connected to them po.